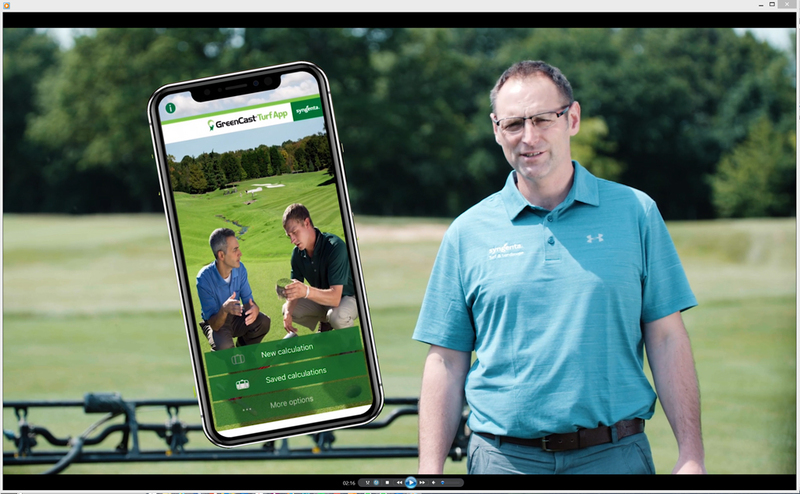 Syngenta Technical Manager, Glenn Kirby, explains the science behind spray nozzle application - and how new XC Technology can resolve practical issues faced by golf and sports turf spray operators. The latest turf protection products are capable of achieving exceptional results. But it is the skills of the sprayer operator and developments in the technology he uses that can make the crucial difference between an acceptable level of control, and outstanding performance in maintaining the high turf quality increasingly demanded by today's players. 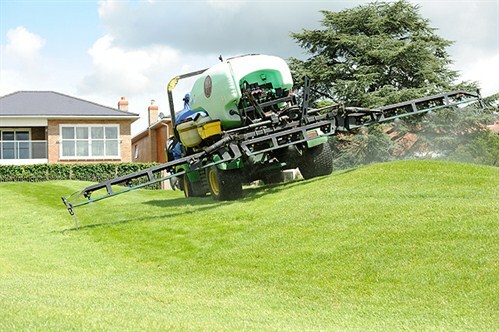 Turf sprayer operators face a number of unique challenges to achieve accurate and consistent results, often whilst under the close appraisal of a critical audience among players. Understanding the fundamentals of the mechanics of spray application, recognizing the targets to be hit and the need for effective timing are all key elements of the Art of Application. Furthermore, today's operator has to be ever more mindful of the essential area of spray stewardship, avoiding problems of waste and minimising risk to the environment. All nozzles produce an array of droplet sizes; large nozzles tend to produce more large droplets with greater velocity, whilst small nozzles create more small droplets. In general, small droplets are well retained on the shiny leaves of turf grass plants, where large solid droplets tend to bounce or roll off. However, small droplets with low velocity are far more susceptible to drift. This problem is especially difficult when spraying fine turf surfaces. As the spray descends it has to force the air below out of the way. In long grass rough that is relatively easy and in practice the air movement effectively pulls the spray into the target. However, with a short cut fine grass surface, such as a golf green, there is nowhere for the displaced air to go, so any fine spray particles with low velocity find it very difficult to reach the surface and many are lost as drift. Fairways and sports turf surfaces are typically somewhere between the two extremes. However, simply increasing droplet size per se is not the solution to overcoming drift. 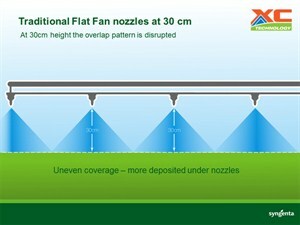 Using a traditional flat fan nozzle, when the drop size is doubled the number of drops produced is reduced by a factor of eight, and the coverage of a flat area or ground may be four times less for any given volume of water. Also, using larger flat fan nozzles to produce larger water droplets tends to result in higher water volumes, which can lead to overwetting of the leaf surface and excessive product runoff and loss. New nozzle technology has seen the advent of air induction (AI) nozzles, where every droplet contains a tiny bubble of air. As the spray passes through the nozzle, air is sucked in by venturi-effect and mixed with the spray liquid. Although the drops are larger, size for size, the air-cushion acts as a shock absorber when the droplets hit the leaf, which means they tend to be better retained on the leaf surface, compared to a large solid water drop. 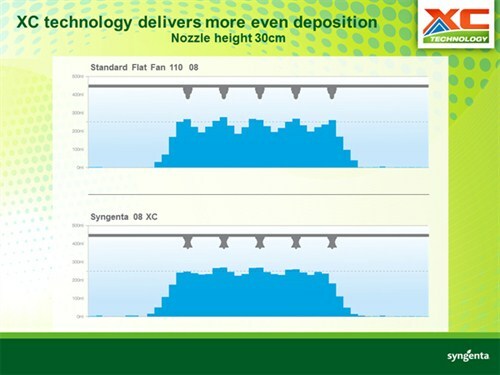 Utilising this design the new Syngenta Turf XC Nozzles produce significantly more droplets per ml of spray liquid, compared to other AI or low-drift nozzles tested. This helps to ensure good coverage of the target leaf. 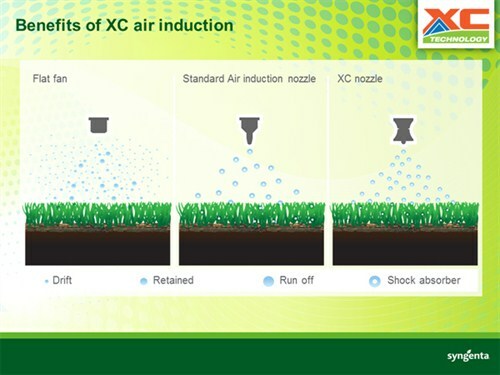 Importantly, tests have shown the 04 XC foliar nozzle, for example, produces less than 3% small sub 100 micron-sized droplets that are highly susceptible to drift, compared to 14% with a traditional flat fan nozzle. The extra velocity of the larger droplets means they are significantly less susceptible to drift. 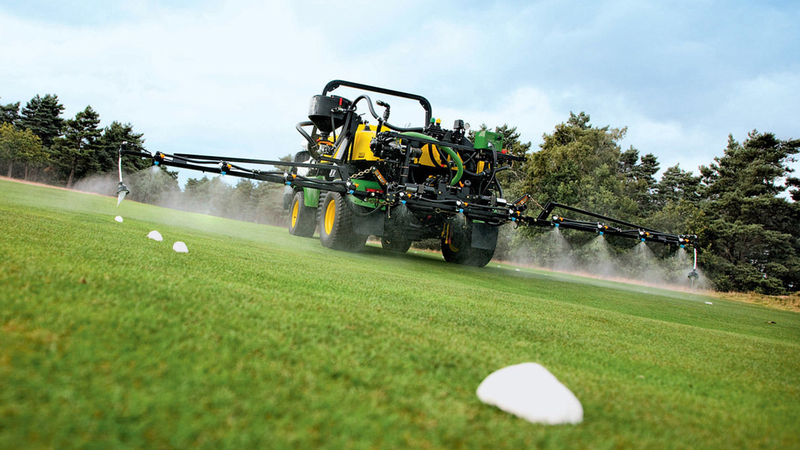 In practice, the drift reduction typically gives an average three to four extra days per month suitable for spray application - enabling more timely treatments essential to achieve better results. Managing drift is especially important in amenity situations that are under public scrutiny. The effect can be clearly seen in practice, even in relatively still conditions. Pictured below the sprayer is fitted with conventional flat fan nozzles in the left hand section of boom, and new XC Turf Nozzles in the right hand section. The size of the nozzle orifice primarily dictates the spray water volume, within the parameters of the sprayer speed and the operating pressure. The outputs are standardised, with an 04 nozzle giving twice the output of an 02 at any given speed and pressure, whilst an 08 will give twice the output of an 04, etc. Forward speed also has an effect on the water volume physically applied. Reducing the speed from six to four km/h, for example, will increase the water volume, and therefore the product application rate, by 50%. This is a factor to consider when spraying greens, for example, where there is a tendency to slow down at the start and end of each run. Raising the operating pressure will also increase the water volume, but as a result will tend to increase the number of small droplets and therefore the risk of drift, especially with traditional flat fan nozzles. Reducing the pressure will reduce the driftiness of a nozzle, but can compromise the spray pattern and the velocity of droplets to hit and stick on the target. Most nozzles are designed to work most efficiently at three to four bar. Variable Pressure (VP) nozzle design is a useful development in that the nozzles can be operated at a wider range of pressures, in some instances down to as low as one bar. This can really help if the wind gets up during spraying, when lowering the pressure could help get the job finished; albeit possibly not spraying quite as efficiently. Remember you will have to adjust your forward speed accordingly, but a good understanding of the relationship between speed and pressure will facilitate that. Whilst one nozzle size can deliver different water volumes by adjusting speed and pressure, you can be more efficient and precise in your accurate application of the most appropriate water volume by selecting different nozzles sizes. A good selection to have available for consistent application in most turf situations at two to three bar would be a set of 025 nozzles for greens, delivering a water volume of 200 - 300 l/ha at four to five km/h; 04s applying 220 - 380 l/ha at five to seven KPH on fairways and a set of 08s that will deliver 450 - 770 l/ha at five to seven km/h. 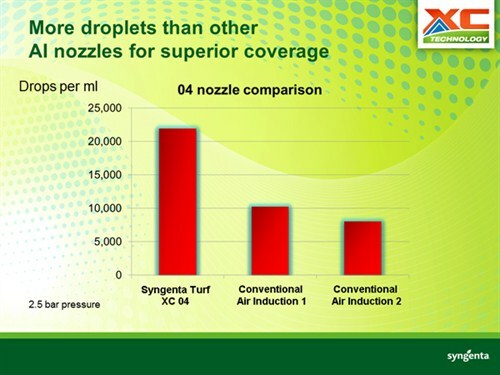 Nozzle output (l/ha) from the Syngenta Turf XC Nozzles at typical spraying speed and pressure. Operators can fine tune application rates during the calibration process by adjusting forward speed and pressure accordingly. A free on-line calculator on the GreenCast website can be used to work out the optimum settings for required outputs. That is very easy if you have a sprayer nozzle holder that accepts three or four bayonet housings, where you can fit the required sets and simply twist around to the required nozzle. If not, it is easier if you buy additional sets of nozzle holders, which are relatively cheap, and make them up in the work shop with the seals fitted. Store each set in a separate clear plastic box, with the name and size written on the top, and simply swap over the bayonets to change nozzles, rather than the time consuming and messy job of changing individual nozzles. Always keep a record of the spray output charts for each of your nozzle sets, as these will be invaluable when calibrating the sprayer and establishing the optimum performance for your individual sprayer. Nozzle height is a critical factor in achieving even coverage across the turf surface. On flat sports fields and stadia it is relatively straightforward and an even height can be constantly maintained -although take care where the playing area is raised and then drops down a slope at the edges. However, on golf courses where slopes and undulations are integral to creating a challenge for players, the variation in nozzle height can have a profound impact on the spray pattern and consistent application. Most nozzles are designed for optimum performance when operating at a height of 50cm above the target, to give a double overlap that minimises any inconsistency in the spray pattern. The problem arises when a sprayer starts to go up a slope, the boom drops down and the nozzle height can drop to 30cm or less. 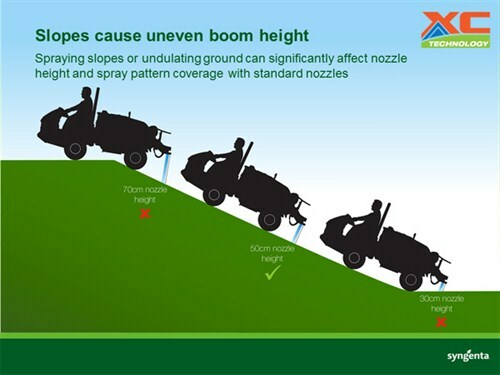 When the sprayer reaches the top of a slope, the nozzle height may jump up to 70cm or more. The effect will be more severe the greater the distance between the boom and the rear wheel axle that acts as the pivot point. 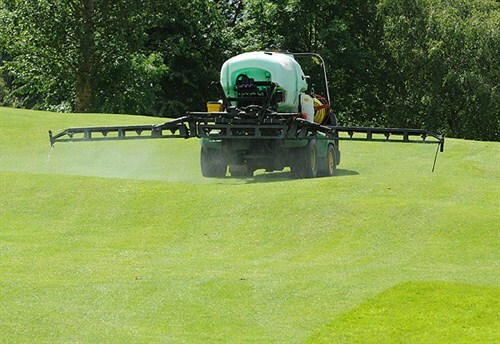 With self-propelled sprayers this distance can be quite compact, but with utility vehicle or tractor mounted sprayers commonly used on golf courses, the effects can be particularly severe. Some turf sprayers do now have automatic height-sensing booms, which can be effective at boom leveling when spraying across slopes, but are generally not quick enough to react to sudden changes in slopes. Do check the sensors are kept clean. Testing trials with traditional flat fan nozzles at 30cm spraying height have consistently shown a difference in excess of 25% variation in spray volume across the boom. This has significant implications for product performance of fungicides and fertilisers, if different turf plants are being overdosed or underdosed by this order of magnitude. 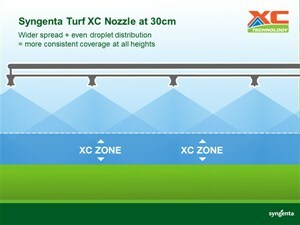 To overcome this problem the new Syngenta Turf XC Nozzles have been designed to give a far more consistent spray pattern if the nozzle height falls to 30cm or less. The key is not, as first believed, to simply widen the spray pattern from the standard 110 degrees. But it has required an entirely new approach to the shape of the nozzle orifice - incorporating a unique elliptical design - which ensures a more even distribution of droplets across the spray pattern. The XC Nozzles now give a spray overlap across three nozzle widths at a nozzle height of 50cm. But if the height is reduced to 30cm when encountering a slope, it will still maintain a far more consistent and even coverage - typically within two to five % difference across the full spray boom. Remember when measuring the spraying height, it is essential to measure from the tip of the nozzle to the turf surface, not the boom height - with some machines the nozzle can sit 10 to 15cm below the boom, which would have a significant effect on the spray pattern. Also, check that the boom is horizontal across its full width; a number of the turf sprayers encountered over the course of testing the new nozzles have suffered from droopy booms, with end nozzles five or 10cm lower than those in the middle - which makes consistent application impossible. One useful tip is to fit the Syngenta Nozzle Height indicators onto the boom ends. These flexible plastic ties can be quickly fixed onto the boom, and are pre-marked at five cm intervals - simply line up the bottom of a nozzle with one of the marks, count off to further 10 marks and snip-off the end. This gives an easy visual indication that the boom is level and operating at the correct height. As a general rule, where undulating ground is a significant issue operating the boom at slightly above 50cm is better than too low. However, as the boom height is raised so the risk of drift increases; trials at Silsoe Research Institute have shown that at 70cm height the level of drift increases dramatically. New nozzle technology is designed to largely overcome these issues in turf. With most spray applications the aim is to get all round coverage of the leaf surface, to maximise product retention and optimise the uptake. 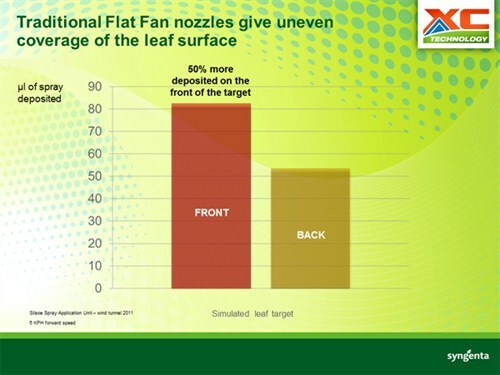 The problem with conventional flat fan nozzles that point straight down is that, with the forward momentum of the sprayer, when they actually hit the target they are moving forward, so one side of the leaf receives over 50% of the spray, with the other side less protected. This has been independently evaluated by the Silsoe Spay Application Unit. 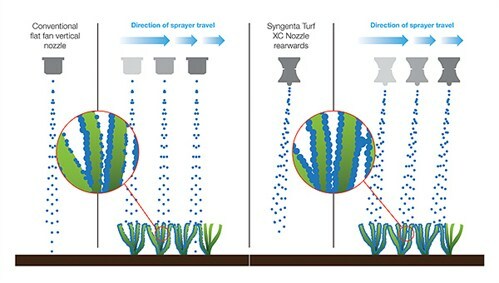 The solution has been to engineer a directed angle into the design of the new Syngenta Turf XC Nozzles, such that the spray is angled backwards, which counteracts the forward movement of the sprayer to deliver a spray falling vertically at the point of impact and covering both sides of the turf leaf. 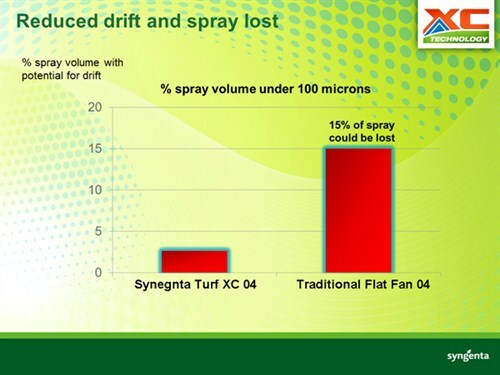 The actual angle of spray for each XC Nozzle size has been tested and calculated by the Silsoe spray technicians to deliver the optimum descent at typical working speeds in turf situations. Furthermore, when operating with larger 08 sized nozzles designed for wetting agent, liquid fertiliser and soil treatment fungicides, the angled spray pattern can achieve better penetration of the dense turf sward, to reach the target soil surface more effectively. Calibrate your sprayer accurately for each set of nozzles, and check regularly for signs of wear or uneven patterns. Some liquid fertilisers, especially iron, can be especially abrasive and lead to high levels of nozzle wear. Once you get in the routine of checking calibration it will only take a few minutes. Machinery maintenance is crucial - including checking tyre pressures, the seals on pumps and valves and inspecting pipes for signs of wear or cracking. An annual National Sprayer Testing Scheme (NSTS) MOT is extremely good practice as a sprayer health check, but needs to backed up with a routine look around the sprayer before every use.